Some CPAP users prefer a maskless CPAP. Some CPAP users have found that the CPAP Pro sold on nomask.com is the lightweight answer to a maskless CPAP. CPAP Pro has many advantages; however, there are downsides to consider. A traditional CPAP mask relies on either a plastic nasal mask or nasal pillows, both of which must be held securely onto the face with straps. The fit must be secure to ensure that there is no air leakage, a necessity to maintain a constant air pressure. Without the correct air pressure, the patient is not able to enjoy the benefits of using the CPAP machine. They will not be able to stop the apneas that occur and they will have a greater chance of suffering from the health problems which can be caused by sleep apnea. Nasal masks and nasal pillows cause comfort issues for many wearers. The tightness of the mask frequently causes skin irritation around the nose. Strap adjustment problems can range from facial indentations caused by the straps to masks that slip during sleep, causing leakage. 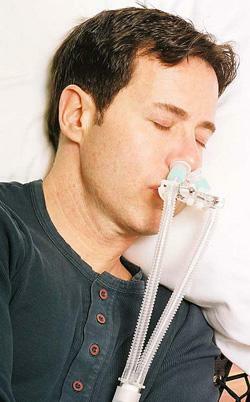 In 1996 Joseph Goldstein, an inventor, was diagnosed with sleep apnea. He found it very difficult to sleep with a traditional sleep apnea mask. Like many sleep apnea mask wearers, he found that the mask would shift from side to side on his face during sleep, causing him to have to tighten the straps even to the point of pain. By 1999 Goldstein had invented a maskless interface that centered on the upper teeth. It was subsequently approved by the Federal Drug Administration. By creating a mask that could be held stationery with a mouthpiece, the interface could be more comfortable for the patient as they slept. They would not have to contend with leaking masks and confining straps. A key part of the CPAP Pro is a customizable mouthpiece that snaps onto the upper teeth. Two respiratory tubes, both held steady by the mouthpiece, carry pressurized air from the CPAP, APAP or BiPAP machine to the nostrils. The tubes, and the hose which connects to the machine, can be placed in any direction - over the head, down the chest or to the left or right. The "Boil 'n Bite" mouthpiece can be customized at home. It is softened by boiling in a pan with several inches of water. The softened mouthpiece is then cooled down to about 140 to 150 degrees. At this point the mouthpiece is held around the upper teeth while the mouthpiece cools. The process can be repeated if the resulting form of the mouthpiece does not tightly snap onto the upper teeth after it is cooled. The customizable mouthpiece can be a difficult or impossible feature for some patients. A special kit is available for use by dental professionals for patients who have dentures or for patients who are sensitive to the heat of the molding process. Soft nasal puffs fit inside the nostrils to carry the pressurized air. There are holes for exhaled air located under the puffs. These holes are surrounded by foam. The foam quiets the sound of the exhaled air and keeps the exhaled air from flowing as a steady stream onto the patient as would be experienced with other nasal masks or nasal pillow masks. Soft, corrugated tubes carry the pressurized air from the machine to the nasal interface. Both tubes are made of a soft material which tends to wear out quickly. Replacement tubes are available. There are many reportedly satisfied users of the CPAP Pro. Users report the comfort of sleeping without the traditional mask straps. User comments also reflect that some users have been able to successfully use the CPAP Pro mask when they had unable to sleep comfortably using other CPAP masks. Designed for lower pressures - The CPAP Pro is recommended for use by patients who have prescribed air pressures of 13 or less; however the manufacturers of CPAP Pro report successful use by some patients with pressures in the 18 to 20 range. Patients with higher pressures should consult with their sleep professional to see if they can, in fact, still use the CPAP PRO. Not designed for dentures - Patients with dentures should check with their dentist before using CPAP Pro to see if their dentures can be left in during sleep. Lightweight - Patients should be careful when using and storing the CPAP Pro to make sure that it is not accidentally broken. It should be safely stored away from sunlight, pets and children which could damage the mouthpiece, nasal interface or corrugated tubes. Not Durable - The manufacturer states that the until will last for several years; however, various parts of the unit are reported to wear out within months, requiring most parts to be replaced within six months. Replacement parts are available from the manufacturer on a special parts website. There are brochures available online to further explain the CPAP Pro. Nomask.com parts website offers a downloadable User's Manual. Both pieces of literature provide detailed graphics and explanations about the various parts. The CPAP Pro is somewhat more expensive than traditional CPAP masks. Retailers sell the unit for about $160 to $180 (as of 2010). Some retailers provide senior and veteran discounts. The CPAP Pro unit can be the answer to the many sleep apnea patients who have been unable to use a traditional CPAP mask. Its design minimizes the leaks caused by the slippage of most masks. Be sure to check with your sleep professional to see if this mouthpiece-based design is right for your sleep apnea treatment.